Spammers behind this even used the From field to trick users into believing that this came from the legitimate Intuit, Inc. Users who may fall victim to this particular ploy could find themselves supplying cybercriminals with their own credentials, which in turn may lead to identity theft or other malicious criminal activities. 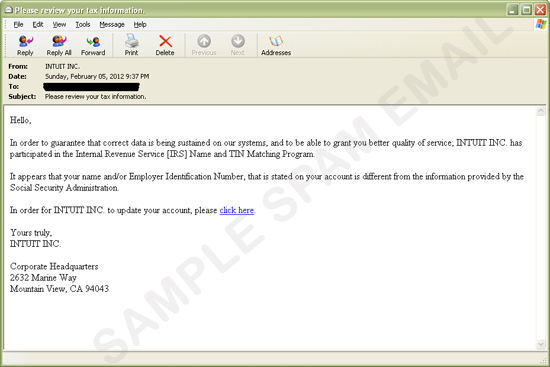 Should users receive messages of a similarly suspicious nature, Trend Micro strongly recommends to delete such messages immediately. Best to check the official Internal Revenue Service website to check for such programs and avail of them there. Users are also advised to be vigilant, most especially during tax season and other noteworthy occasions. Social engineering based on events and seasons are just one of the tools that cybercriminals use in their crimes. 12 for 2012: What Will The New Year Bring? Tax Season Opens, Tax Spam Follows?